The particle weight of 21 glycoproteins has been determined by SDS-PAGE and high-speed sedimentation equilibrium, focussing on the influence of carbohydrate content, partial specific volume (\(\bar v_2\)), and relative molar mass (M r) on the results of both techniques. Results were compared with literature data and with 22 nonconjugated proteins yielding the following results: (i) \(\bar v_2\)of native glycoproteins decreases linearly with increasing carbohydrate content. Therefore, \(\bar v_2 - values\)of glycoproteins not accessible to experimental determination may be calculated. (ii) The determination of M r of glycoprotein subunits by SDS-PAGE shows anomalies in the electrophoretic behaviour. Small amounts of impurities have no influence on the result, if one refers only to the major band(s). Systematic variation of the electrophoretic parameters T and C, as well as use of Ferguson plots only leads to insignificant improvements. There is no correlation between the carbohydrate content and anomalies in the electrophoretic behaviour. A possible explanation for this behaviour may be found in different conformations of the sugar moiety, different interactions with the electrophoresis gel, and different extent of SDS binding, (iii) Analytical ultracentrifugation yields accurate values for M r of native glycoproteins, independent of the carbohydrate content and the size of the molecule. 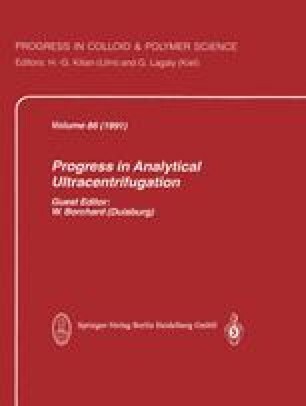 The application of this technique, however, requires the exact knowledge of \(\bar v_2\)and the absence of impurities, (iv) A comparison of the molar subunit masses obtained by the two methods with literature values clearly proves the superiority of analytical ultracentrifugation, when compared with SDS-PAGE.